These small and lightweight units can be configured as an on-line UPS, frequency converter, phase converter or AC voltage regulator. Provides a wide input range with tight output voltage regulation of +3%, as well as extended brownout protection. Accepts a 50, 60 or 400Hz input with a 50, 60 or 400Hz output. Models supporting single and three-phase inputs with single-phase outputs are offered. This series utilizes a field-proven high performance online design and is ideal for military COTS and aviation applications. Lightweight and only 4U high, these units are easily customized with numerous options. 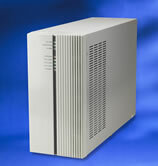 Can be configured as an on-line UPS, frequency converter, phase converter or AC voltage regulator. Provides a wide input range with tight output voltage regulation of +3%, as well as extended brownout protection. Accepts a 50, 60 or 400Hz input with a 50, 60 or 400Hz output. Models supporting single and three-phase inputs with single-phase outputs are offered. The ED Series utilizes a field-proven high performance online design and is ideal for military COTS and aviation applications. Ultra-high performance Uninterruptible Power Supplies (UPS) for industrial and military COTS applications requiring a rugged UPS. Designed to protect sensitive equipment used in harsh power environments. Supports high inrush loads and high temperature environments. Other ED Series models are available offering operation as Voltage and Frequency Converters and precision AC voltage regulators. The 3-5kVA models are some of the smallest and most lightweight units of their kind.